And who am I tagging? For a foodie, I'm choosing Pille at Nami Nami who's away in Mexico and I bet is sure to have lots of wine-food-experience to talk about, and for a wine blogger.. I'm actually going to tag a Swedish one, Vinbloggen who is run by Morgan Skantz, currently living in Spain. So - what wine would that be then? 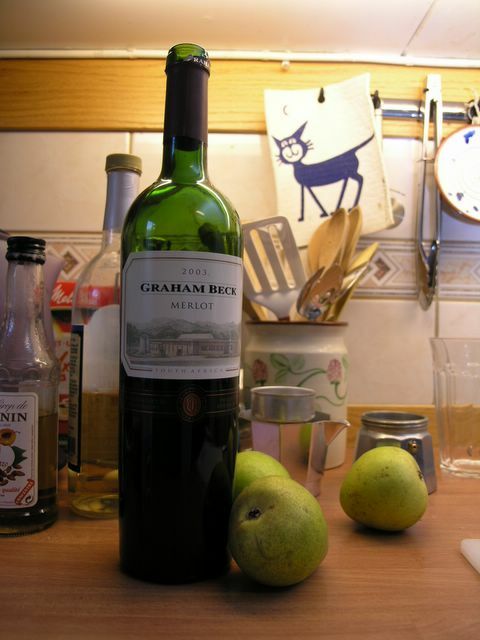 I'm using a bottle of Graham Beck Merlot, 2003 from South Africa. It was very nice here - soft and mellow, and a perfect pairing with the aromatic rosemary and sage, and the sweetness from the pears. This is, however, the time to admit that I mostly like wine on its own, or possibly with cheese. I rarely manage to get that ultimate experience with a great wine/food pairing, and thus usually drink water with my food. Get out a large pot, and melt a pat of butter. Sear the meat, until it has some color on all sides. Add the garlic and onion. Salt generously. Add the wine - it should almost cover the meat. If it doesn't, add water. (About a cup or so). Bring to a boil, cover, and let simmer for 20 minutes. At that point, add the carrots and the fresh herbs. Keep simmering for 20 more minutes. Then, add the pears, the walnuts and the cream. Continue to simmer for another fifteen minutes, then add the cornstarch, bring to a final boil and simmer until it's thickened slightly. 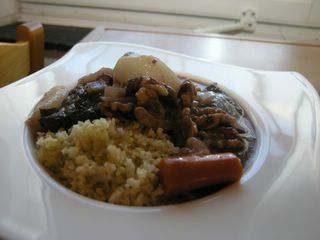 Serve with your choice of carbs or starch - we ate it with bulgur, it'd have been nice with boiled potatoes or rice as well. Hi Anne, thanks a lot for tagging me! I'm in Mexico for another 2 days, and will be back in Edinburgh on Monday. I will try to respond during next week. And your stew sounds lovely!